Juice the lime. Slice mint leaves into fine strips. Cut watermelon into bite-sized pieces. 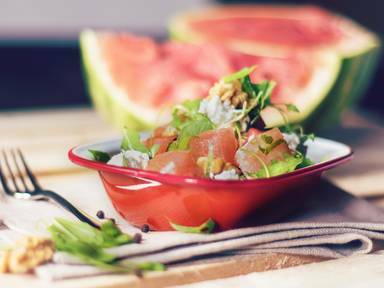 Place the cut watermelon and mint into a large bowl and season with lime juice, olive oil, sugar, salt, and pepper. Gently break walnuts apart by hand and add to the water melon. Wash and dry arugula and add to watermelon. Mix everything together and crumble goat cheese on top. Serve on a plate and decorate with fresh mint leaves as desired.